How do you class a bike that has won the Enduro World Series Team Championship not just once but twice? It’s pretty good, right! Now, what if we were to tell you that the same bike has just been refined into a new step forward, a new Strive, faster and more versatile. Well, Canyon have done exactly that and today marks the official launch of the new Canyon Strive 2.0! Last week [R]evolution flew to the south of Spain to discover how the bike performs. In summary, this thing is a total beast! When Canyon first debuted the Shapeshifter on the original Strive, it seemed to be a ground breaking move forward. Providing the handling of both an ‘enduro’ bike on descents while being able to perform like an XC rig on the climbs. While the idea was exceptional, it had very minor drawbacks in terms of usability – not anymore. With Shapeshifter 2.0 all of the ‘bugs’ from mark 1 have been ironed out. This thing is just awesome! No longer do you need to hold in the lever while changing modes, simply click or clack the lever between modes, and once you hit the first compression (from climb to descend) or unweight the bike (descend to climb), the gas spring will set to the predetermined location. There will be no more worrying which mode it is in, if it is in the correct position, and difficulty in switching. What is the Shapeshifter? The Shapeshifter works using a gas spring which Canyon have developed together with the suspension specialists at Fox. Essentially it enables the rider to alter the geometry and suspension dynamics on the bike with a single touch. With nothing more than a flick of the lever, it will change the bike’s geometry and the kinematics of the rear triangle, with a difference of rear wheel travel going between 135mm and 150mm. In DH mode, the bottom bracket height is reduced to provide a lower centre of gravity, a slacker head angle, and the wheelbase is extended for more stability in fast sections – advantages that make all the difference when every second counts. It has been proven again and again that the larger wheels have the performance to really shine in technical terrain. Having the larger diameter gives ability to roll over with less resistance, along with the larger contact patch, making all the difference for max grip. For this reason, Canyon have decided to make the all new Strive exclusively available as a 29er. Gone are the days where bikes had alloy rear ends. The Strive is a no-compromise racing machine, available in full carbon only – linkage included. Models 5.0 to 8.0 are built around the high-performance CF frame, whereas the 9.0 Team and the 9.0 LTD come with the yet more advanced CFR frame. The difference between the frames is the layup of the carbon fibre: the type of fibre, the way the fibres and resin are combined, and the alignment of the weave. The CFR frame is around 300g lighter than the CF (frame weight CFR: 2400 g w/o rear shock) while being just as stiff. The triple phase suspension system is at the forefront of Canyon’s philosophy. Originally developed for the Sender, it has made its way down from the top tiers of downhill racing and into the enduro machine. At the start of the stoke, the suspension provides plenty of traction, and outstanding small-bump sensitivity. Through the mid-stroke, the shock provides a stable platform, letting the rider put maximum power through the pedals, keeping their speed up over uneven ground, and accelerating hard out of berms. The end of the stroke ramps up progressively, so the rider uses all the travel when absolutely required. As all bikes should, the Strive is sporting extremely clean internal routing. They have a nicely moulded guard on the lower third of the down tube as well as another on the top of the chain stay to prevent chain slap, and also reduce noise. Boost axles fitted both front and rear to prevent unwanted flex. Last year we saw Canyon introduce their tool free rear axle system. Where the lever is integrated extremely well inside the axle itself, held in by a small magnet. It simply pulls out and twists to tighten/undo and slots back into place, out of sight. Sizes range from Small through to XL on all models. One nice detail is that S-M models come with 20mm rise handlebars while to L-XL sport 30mm. Cool story, but how does it actually ride? 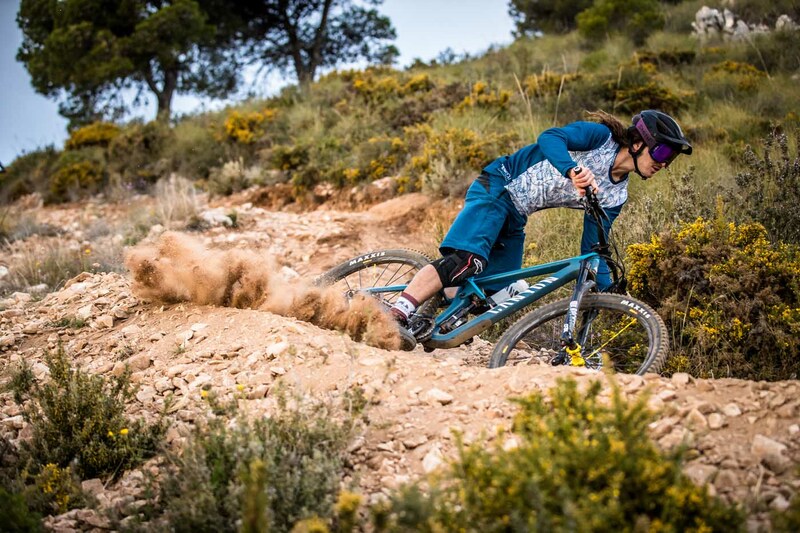 The launch took place over in Malaga, Spain, where we got to spend a couple of days aboard the new bike riding epic trails with Canyon’s factory team riders Fabien Barel and Dimitri Tordo, while also learning all the new bits from the engineers themselves – who also happen to be shredders! Before I begin I must say – prior to this trip I had never ridden a 29er, I was just a kid who had only ridden small wheels and loves to jump. I’m not exactly a fan of tech trails, so I was in a very new atmosphere being nothing but loose rock in Malaga. First run – I dropped into a steep and sandy chute behind Fabien. What a start, thankfully the brakes worked! It was a battle of wanting to stay on his wheel, while also riding the track blind on a completely new bike. No more than 5 seconds into the track I was riding like I would any other day I’m on it. I felt a strange sense of confidence (or maybe it was just adrenaline). It was a rush of excitement. Coming to the end of the first section and all of a sudden we’re on a flat bit of single track travelling the forest. Fab yells out to hit the Shapeshifter… instantly I was blown away by the pedalling efficiency. It felt like every stroke was on a hardtail but the roots were passing under the wheels without a hint of feedback. Fast forward to the bottom of the run and he asks how the switch felt, stumped I had realised I hadn’t even put it in short mode, and it was still that efficient. I guess I was too focused on holding his wheel. Following the second run I was asked my thoughts on the big wheels. Again, I was stumped. I enjoyed the ride so much that I had absolutely no idea about the difference in wheel size and had not a single complaint. You could have given me the bike without telling me and I would have ridden it just the same. Tech trails? What even are they… Aboard this bike I had a whole new confidence in riding over jagged and awkward rocks. Something that has never taken my fancy has suddenly become something I enjoy quite a bit. A new found source of enjoyment thanks to a few awesome changes in my set up. I’m excited to see where this may take my riding and I’m sure you will be too.